Lyme disease was first recognized in the U.S. in 1975 in Lyme, Connecticut. During this time, a mysterious outbreak of rheumatoid arthritis was spreading in and around the town, affecting mostly children. Two mothers, in desperate need of medical help for their families, reached out to the Connecticut State Department of Health and the Yale School of Medicine. Later that year, a surveillance study led by Dr. Allan Steere and Dr. Stephen Malawista showed that the majority of patients lived in rural wooded areas of town (Elbaum-Garfinkle 2011). Furthermore, in 1983, it was discovered that “Lyme arthritis” (as the disease was initially named) was actually caused by the bite of a tick! Today, we know that Lyme disease is caused by a spirochete, a type of bacteria that has a characteristic ‘spiral’ shape. The name of the bacterium is Borrelia burgdorferi. In order to infect humans and other mammals, the bacteria must use a reservoir host, which in this case, is the deer tick (Ixodes scapularis). For more information on disease transmission and the life cycle of deer ticks, please see the “Tick Ecology” section. 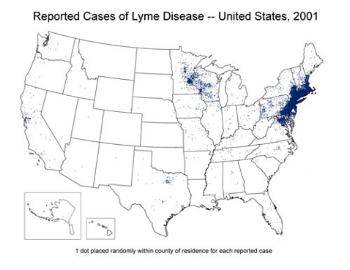 Who Gets Lyme Disease & Where? About 300,000 new cases of Lyme disease occur annually in the U.S., mostly in the Northeast and Upper Midwest regions. In Wisconsin, Lyme disease is the highest reported tick-borne disease, with the highest number of cases occurring in northern and western regions. The risk of exposure to infected ticks is greatest in the woods and in edge area between lawns and woods. Campers, hikers, and outdoor workers are most likely to be infected, especially in late spring/early summer, when nymphs are most active. Additionally, people who are 5-15 and 45-55 years of age are especially susceptible to Lyme disease (Steere et al. 2016). Early Lyme disease is marked by erythema migrans, a red circular rash that usually appears at the site of the tick bite within 3-30 days after being bitten. The rash may develop a “bullseye” appearance as it enlarges. The rash is rarely itchy or painful, but may feel warm to the touch. Erythema migrans is the most common symptom of Lyme disease —in fact, it occurs in about 70-80% of infected people (Steere et al. 2016). As the disease spreads to other parts of the body, some patients also experience facial palsy (muscle weakness on one side of the face), as well as irregular heart beat or heart palpitations, which are referred to as Lyme carditis. Diagnosis usually requires a series of blood tests to detect whether the patient has antibodies to Lyme disease bacteria. However, if the patient has an erythema migrans rash AND lives in a region where Lyme disease is endemic, serological testing is not required. One issue with serological tests is that it can take 4-6 weeks for the body to produce measurable amounts of antibodies (Steere et al. 2016). Therefore, patients who were recently infected may test negative, even though they are infected (false positive result). Antibiotics can be given by mouth, or, in more severe cases, intravenously. Normal treatment involves 2-3 weeks of oral doxycycline or amoxicillin. Persistent symptoms may require an additional course of antibiotic treatment. However, long-term antibiotic therapy is not recommended (Steere et al. 2016).